Have your job opening posted to our job board for three months at a time. For an additional cost you can choose to place an ad in our weekly email newsletter (2x) plus promotion through our social media networks (1x). To the right, please select the desired option. Please submit your job opening to [email protected] Needed: Company, Position Title, Location, Type (Full/Part Time) and Full description (Must contain a point of contact, link to apply or instructions on how to apply). Loyalty Management is a quarterly publication that reaches 18,000 executives across a variety of industries. With over 2/3 of our readership holding senior-level positions, your ad will reach readers with the power to make decisions and help grow your business. To the right, please select a) requested quarterly run time and b) ad size. To purchase placement in multiple issues at discounted rates, please contact Mark Johnson at [email protected] to request a media kit. Loyalty Management Magazine is a one of a kind, customer-driven publication focusing on loyalty marketing. Loyalty Management is committed to creating a documented customer-centric forum for sharing ideas, concepts and trends across all industries interested in proactively communicating with their customers and each other. Below, please select the annual subscription type. Promote thought-leaders in your organization through highly-engaging multimedia content, produced by Loyalty360. 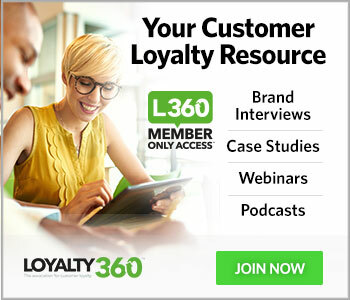 Loyalty360 podcasts and videos feature interviews and commentary from brand marketers and loyalty industry experts who share the stories of their unique journeys and perspectives on loyalty marketing. Loyalty360 will work with you to develop a turn-key webinar marketed and administered by us. Our standard webinar package comes with consultation, training, marketing, moderation, full-service administration, polling, registration and attendee reporting, recording and deck archival and more. Our premium webinar package includes additional features. Please contact [email protected] Our webinars average between 200-400 attendees at present.